Circuitry really is the new root system, no? Wires connecting us all over the planet. 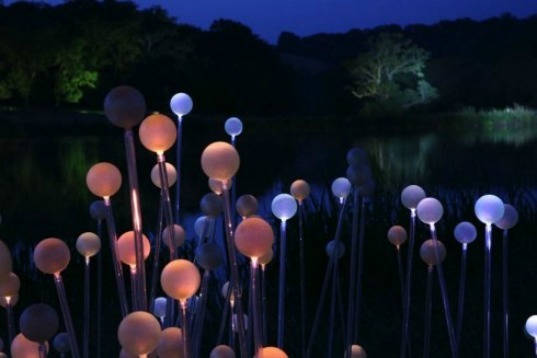 So it’s inspiring to envision the coming work of artist Bruce Munro: a field of glowing orbs growing up out of Longwood Gardens, connected by a series of fiber optic “roots.” Moreover, the orbs will contain tiny glowing fibers themselves, each glowing a different hue. It’s similar to some past work by Munro, but no less otherworldy in its concept. Read on to discover more about this ethereal work. The installation will include 20,000 stems of light gathered along a central garden path. Scheduled to sprout in the summer of 2012, the artwork will be one of several commissions for Munro throughout Longwood Gardens. 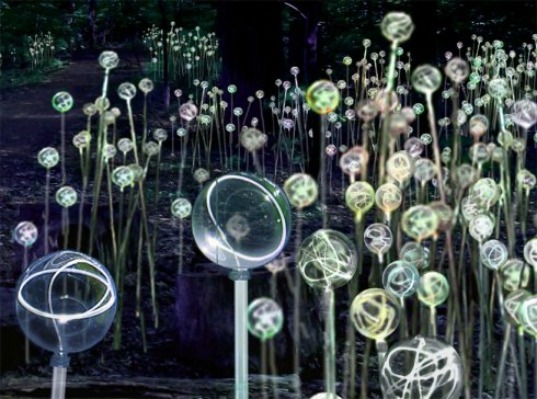 Similar to his “Field of Light” project in the United Kingdom, the orbs suggest a new species of plant life, evolving to help guide humans along a more sustainable path. Circuitry really is the new root system, no? Wires connecting us all over the planet. So it's inspiring to envision the coming work of artist Bruce Munro: a field of glowing orbs growing up out of Longwood Gardens, connected by a series of fiber optic "roots." Moreover, the orbs will contain tiny glowing fibers themselves, each glowing a different hue. It's similar to some past work by Munro, but no less otherworldy in its concept. Read on to discover more about this ethereal work.